Every blog requires proper SEO to gain readership. 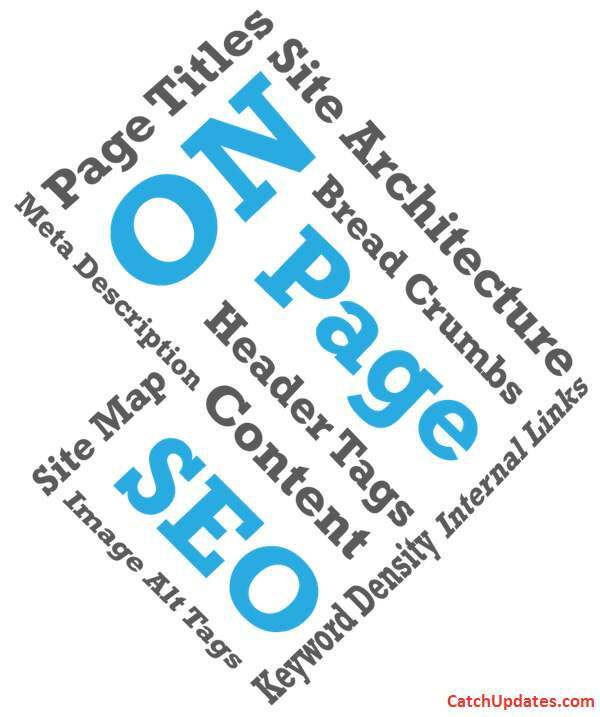 SEO mainly covers On Page SEO and Off Page SEO. This article enlists On Page SEO techniques to improve website ranking. Let’s start with this simple question – what is On Page SEO? On Page SEO refers to how you optimize your content for search engines to rank high. Blog Post Title plays the vital role in deciding how your blog posts will be performing on search engines. You should keep targeted keywords or phrase towards the beginning of Title tag. Blog Post Title holds a lot of value in on page SEO techniques. Make sure you are not repeating the same keyword in title tag with the intention to get better rankings on search engines. The ideal character length for blog post title is 65 characters including spaces. A title tag is used by search engines to display a page in search results and can also be found at the top of your browser. Title tags tell search engines and searchers what the page is about. Since Google will only display between 50-60 characters in the title tag, you should keep title tags under 55 characters and try to drive people to click on compelling copy. The next factor while doing On Page SEO is defining your post permalink structure wisely. Similar to blog post title, you should aim at using targeted keywords towards the beginning of blog post URL. Never use special characters, symbols, brackets in your post URL. A URL is one of the first things a search engine uses to determine page rank, which is why it is really important to make your URLs easy to crawl. Try keeping the URL length to 4-5 words. Search Engine crawlers do not understand images. They can understand the only text. To get your blog images better optimized, you should use the ALT tag. Alt tag should be relevant to your image. For instance, if you are writing an article on Blogging tips and inserting an image then it should have a relevant name not something like image.jpg or image01.png etc. We cannot miss Meta Description when we are talking about On Page SEO techniques. The key mantra is – Add unique and relevant meta keyword and meta description with each of your blog post. And yes, Use your targeted keyword in the meta description and meta keyword section. The meta description is of 160 characters and you should write this wisely for better Click Through Rate (CTR) which means more users will open your link. It should be promising enough to attract visitors. Also, Google and other search engines are noticing the CTR closely. Let us say, you have a webpage ranked on the 1st position in SERP. and 10 out of 100 users who see that webpage clicks on it, it gets a 10% CTR. At the same time, if a webpage that is ranked on the 10th position in SERP gets a CTR of 80%, Google is going to notice that. Since webpage at 10th position is getting better CTR it can be promoted higher in SERP and yours can be demoted as well. Keyword stuffing is the common SEO mistake that many bloggers do. You should keep the keyword density to up to 1.5% percent of the mix of LSI keywords. You should be using your main keyword once in the first paragraph and then in the last paragraph apart from regular use in the blog post content. Keywords should appear in important on-page elements like the page title, heading, image alt text. Maintaining of your main keyword is a very remarkable thing. If your content is of 300 words, then your main keyword should be at least 3 times used. If it 1000 words then your main keyword should be 10 times used in your whole content. If you really want to compete for ranking higher in search engine positions, make sure that your content is too good. Gone are the days when short article used to rank higher. (Looking weird to you?). But my friend, the SEO world is changed now. Google and Users both love to read in-depth and information-rich content. Short articles are not going to work in 2019. Instead, create more in-depth, comprehensive, and informative blog posts that are rich in content and total words. As a matter of fact, Google prefers 2000+ word blog posts. Such posts have a much better chance to be ranked in Google’s top 10 positions. Even I have experienced that mostly my long articles are ranking higher in search engines (I keep on updating my old articles when I find new information or do any research on that). If you post videos on your website try to add a text description as well. If you add images, try to describe in words what the image is all about. Maintain Your Posting Frequency i.e. Keep updating your website at regular intervals. Avoid writing small posts. Ideally, your post should contain minimum 700 words. If possible, write long and well-researched blog posts while targeting highly competitive keywords in your niche. Moreover, if you writing naturally and covering everything related to the topic, your topic would be of great length. Link to internal pages within your site wherever necessary. These types of links have more weight from a search engine point of view. It will also help to decrease the bounce rate of your blog. Apart from linking to your own blog posts, it is a great idea to link out to external websites if you feel the addition of links for them will help your blog readers find more and relevant information about the topic you are currently blogging about. To start with, LSI stands for Latent Semantic Indexing. Did not get it? In simple words, LSI keywords add context and meaning to your post. These are relevant keywords that are supposed to be used along with your main keyword. Search engines like to see LSI keywords in a blog post. For example, Search engine discovers a page with the word “Apple” on it, how does it differentiate whether the Apple is a fruit or Apple is a brand? It uses Latent semantic indexing keywords if there are words like fruit, taste, flavor in the article then it would be easy for search engine to determine that the article is all about the “Apple fruit”. Hence, in this example fruit, taste and flavor can be termed as LSI keywords for keyword “Apple”. LSI keywords have been gaining more and more popularity. In 2019, they are only going to become more famous and common.
. The simple rule is – The longer search terms are, the easier it will be to rank on the term. Long tail keywords are more specific and less common. The longer and more specific the search terms are, the higher the chances of conversion are. One of the benefits of long-tail keywords is you can create different variations of the same search phrase, but it’s important to think about what people would actually look for in search. You can read this article on Tricks To Use Long Tail Keywords. Users don’t like to wait, and we are becoming more and more accustomed to the fast load times, which means your site will be left in the dust when a user must wait. There are plenty of other articles similar to yours. If your web page load time is high, users will close your web page and will try alternative pages available. I am using WP Rocket Caching Plugin to speed up my website. I recommend you same. This is the mobile era and most people carry their mobiles and access the internet through their mobiles itself. If you do not offer your visitors an optimized mobile view of your website you are degrading your SEO Ranking. No one will come back to your website again if they are finding it hard to traverse and check your articles. The article How To Make Your Website Mobile Friendly In 5 Minutes might be helpful for you if your current site is not mobile friendly. These were basic and important tips for On-Page SEO Tip. But always remember you are writing content for human not for search engines. Do not hurt your visitors by overstuffing these rules. That’s all in this. While writing any article you should keep this On Page SEO checklist in mind. Also, Share your suggestions/feedback or any other On Page SEO techniques. Don’t Forget To Share It with your friends and subscribe to our Email newsletter for more such updates.If you have any questions about this On Page SEO guide, please feel free to ask in the comments section below. While all the methods you have mentioned here are simple and common, they are extremely significant. How effectively they are used decide the website’s ranking. Thank you for listing out these points in an orderly manner. Looking forward to more such informative posts, next time related to off-page SEO. Great effort indeed! Great post man! I agree with all the points you have mentioned in this post. One more points I would to add and that is Keeping in mind the RankBrain. While doing keyword research make sure you also keep the keywords that keyword planned doesn’t show you. As you already know that RankBrain process over 15% of online queries itself that’s why is wouldn’t be a wise move to ignore RankBrain. Anyway, that for the share. Keep it up! Thanks. There are many ways to promote websites such as Social media, QA/forums sites, guest blogging, networking with fellow bloggers etc. In starting, it is really difficult to get organic traffic so you can try these things and see if it helps. And simultaneously, continue to write unique content and follow proper SEO guidelines. You will soon start seeing the results. 3) Justify/align your content. It will look professional. 4) Since you do not have much content as of now, you can showcase your social channels so that visitors can connect with you. (As of now, it is in footer and not of much use). Also, G+ not redirecting properly. Try to keep social icons on posts also so that visitors can share on their social channels also if they like your content. 6) Do keyword research properly before writing an article. Make use of Long tail keywords and LSI keywords. Thanks Mohit for your sharing.First of all thanks for the details explanation.On-Page optimization is the core concepts begins with an excellent title.Your points are highly appreciatable and it really implies the clear picture of decent on-page optimization.Overall SEO is very much effective for ranking factors and any optimization strategy bulging methodology owns the crown for better establishment of business growth.On-page optimization is always beneficial for your business growth because it is cost effective and result oriented. Nice Post. You have mentioned some great points on On-pages SEO. You are right on page SEO definitely helps you to increase website ranking. On-page SEO is all about optimizing your content so that search engine like to show it as a top results for searchers of a certain keywords. such an useful stuff that i like to read and found it very useful. Thanks for sharing. Yes these all are the really working for my website. Really worthfull article for the guys who are searching for the on page seo strategies and tips. With my website there is nothing problem with on page seo i followed these tips while doing SEO. Keep postings like this. This is beautifully described post and all these are very useful tips. I really appreciate your effort for covering so many useful insights about on-page SEO. Especially, I completely agree with you on meta description point. I think if you succeeded in writing unique and eye-catching description for your website, it is really going to work for you. Thanks for this great article. Most of the time people focus on Off page SEO. This is such good resource of On page SEO. This is a great post about quality SEO techniques and I learned a lot from it. It is true that Google keeps on updating its search engine algorithms, and this is the reason why SEO is dynamic in a way that it keeps changing as time passes by. Great job on the post!! Wow! Great share! I will follow them all! On page is very important to make search engine friendly. Without on page off page SEO doesn’t matters because if our site is not search engine friendly then we make any backlinks to our site is not working properly. Great Tips! You have mentioned some key points regarding on page seo techniques that’s very useful to improve ranking. I totally agree with your suggestion. Thanks for the article, Keep posting! On Page SEO is very important for ranking. Make sure that you don’t do any spamming activities. One more awesome post. Much appreciated Mohit for giving a spot light over these On Page SEO variables. Every one of these elements particularly title of page must be streamlined shrewdly in light of the fact that title of the page must be attractive for web clients. Very Interesting article and keep sharing the blogs and I regularly read your blog which helps me…To increase page rank on page optimization is very important to a website and in on-page the content is one the most and first factor next meta tags, internal linking, using LSI keywords or long tail keywords in content. Keeping all above techniques in the mind we can increase website ranking. Thanks for sharing about on page SEO. its great techniques to increase over content visibility and traffic. It was a pleasure to read your article. Any expert would agree with you on these points and for the newcomers in the field, this is a complete guide. I second your opinion about almost all the points. I am also in complete agreement with you on the point that nothing should be left to default, just because Google does not give it much importance whether it is keywords density (which like you said can be replaced by LSI keywords) and meta descriptions etc. A very well written article and I really liked how you have incorporated videos in your content. Keep up the good work! Great! Let’s see how it bring results. Do let me know if I missed any key point or any major points that you think could be part of this checklist. We will love to hear back from you. Hi Mohit! I just followed all these ON-page SEO checklist. I’m so excited for the outcome of it. Thanks for the great article. One more great post. Thanks Mohit for giving a spot light over these On Page SEO factors. All these factors especially title of page must be optimized very smartly because title of the page must be eye catching for internet users. on page is slow process but it will definitely give you good result.